U.S. Relations with Iran Remain Cool For now, the United States and Iran talk only under certain circumstances — such as the meetings that U.S. 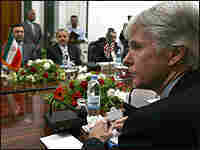 Ambassador to Iraq Ryan Crocker has had with his Iranian counterpart to discuss security in Iraq. Iran's leaders see their nation the regional power, but they have been unable to fulfill this idea. Sixth of the six-part series. 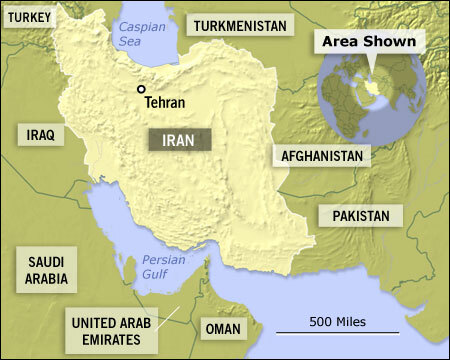 Iran is a Persian state in a region dominated by Arabs, and a Shia nation surrounded largely by Sunni states. Iran's leaders, both before and after the Islamic Revolution, have seen their nation as the key regional power in the Middle East. But since the Islamic Revolution, Iran has been consistently unable to fulfill this ambition. In this series, NPR examines Iran and its relationship with its neighbors. Read an overview of the series. From his office on the State Department's seventh floor, Undersecretary of State for Political Affairs Nicholas Burns sees many dangers of a rising Iran. Burns says Iran is funding Hezbollah, which is destablizing Lebanon, and that it is supporting the Palestinian militant group Hamas and Shiite militias in Iraq. "Iran poses — for vital U.S. security interests — the major challenge throughout the Middle East, and I think we have a fair degree of consensus here in Washington, certainly on Capitol Hill and definitely in the administration, that we have to use the ingenuity and diplomatic dexterity of the United states to contain them," Burns says. The way the United States deals with Iran has been the subject of behind-the-scenes policy disputes. Now, with many of the more hardline types out of the administration, Burns says he runs an interagency group that focuses on diplomacy — not regime change. But asked whether he, as a diplomat, sees himself actually going to Iran — well, that's a different story. "It is the most unusual diplomatic relationship that we have with any country in the world," he says. "We talk with North Korea. We have a diplomatic mission in Cuba. We have a diplomatic mission in Burma. We haven't had normal diplomatic relations with Iran since Iran took our 52 hostages in 1979. I don't see any reasonable expectation that the situation is going to improve." So for now, the United States and Iran talk only under certain circumstances — such as the meetings that U.S. Ambassador to Iraq Ryan Crocker has had with his Iranian counterpart to discuss security in Iraq. The rest of the diplomatic push is all about containment — a policy that has echoes of the Cold War. 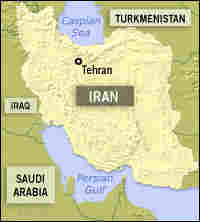 The Bush administration is leading efforts in the United Nations to pressure Iran to give up its nuclear ambitions. The administration is also arming and supporting Arab allies — rivals of Iran — and talking about ways to bolster the forces of moderation against extremism. The problem is, many in the region see America's failed policies as the main reason for Iran's ascendancy, says Ken Pollack of the Brookings Institution. "We took down the Taliban and Saddam Hussein, Iran's two greatest foes," Pollack says. "What's worse, we've created a failed state and a failing state in those two countries. We also helped create failed states or failing states with the Palestinians and Lebanon — two other arenas where the Iranians have been able to make inroads. And we've conducted ourselves in a way that has alienated us in much of the Middle East." Fixing these problems could make dealing with Iran a lot easier, he says, but in the meantime, the tensions are mounting. "I don't really think the Bush administration wants to go to war with Iran — at least as a collective," Pollack says. "That said, there is all kinds of room for miscalculation, especially from what is going on in Iraq." U.S. military officials are angry that Iran appears to be shipping in explosives that are killing U.S. personnel in Iraq. Former U.S. intelligence official Paul Pillar, now at Georgetown University, says the United States is vulnerable. "Their ability to cause far more difficulty in Iraq than they have caused so far is one of the main ways in which they could, and probably are, deterring us from doing something more drastic, like launching a military strike against Iran," he says. Pillar says that's one of the many issues the Bush administration didn't think through before toppling Saddam Hussein. Pillar was working in intelligence analysis for the government at the time. "The intelligence community offered its judgments, as to some of the effects on regional alignments and diplomacy," Pillar says. "We were not asked for those judgments — we volunteered them. But, no, it does not seem to have been thought through before March 2003 by the decision-makers as to just what Iran's role in this equation would be." As U.S. diplomats try to counter Iran's influence, Kenneth Katzman of the Congressional Research Service has some words of caution: Don't overstate the threat. "I would argue that Iran's so-called ascendancy in the region is not only manageable but also reversible — if we understand Iran's vulnerabilities and weaknesses, of which there are many," he says. The Bush administration sees the economy as Iran's main weakness, and is trying to persuade countries and banks around the world to stop doing business as usual with Tehran. That is one way the United States aims to contain Iran's influence and punish the country for its nuclear program.